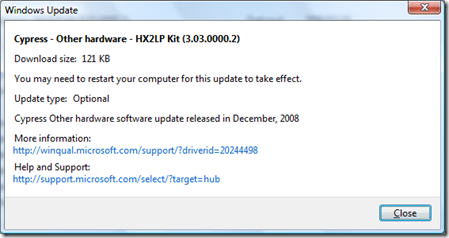 Yesterday, Microsoft’s Windows Update showed the “Cypress - Other hardware - HX2LP Kit (3.03.0000.2)” update for my laptop. I installed it without finding out what it was for. After turning on my laptop, the “AuthenTec Inc. AES1610” hardware was no longer available in the Device Manager. Vista couldn’t find a fingerprint reader. I rolled back Windows a day before I installed the update, and the fingerprint reader came back.